It can never be said that the CPA Exam lacks variety because as one of the most comprehensive accounting certification exams, its content spans a host of accounting topics across multiple exam sections, and it tests your skill through three very different types of questions. You must be well-versed with each kind of question to pass, so let’s introduce them, take a look at some examples, and go over some study strategies. 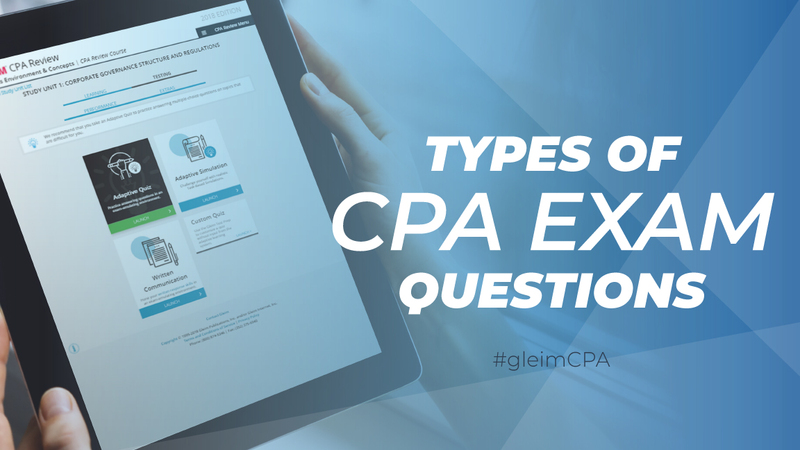 All four CPA Exam sections feature multiple-choice questions (MCQs) and task-based simulations (TBSs). The BEC CPA Exam section also includes written communications. MCQs are fairly common and self-explanatory. They consist of a question stem and four answer choices, with three of the four answer choices being distractors (answers meant to appear correct at first glance), and one answer choice being the best response. TBSs are scenarios that require you to respond by filling in a series of blanks, performing a calculation, revising a text, etc. using information provided either within the question or in exhibits presented with the simulation. One type of TBS known as a Document Review Simulation (DRS) requires you to examine various resources to review a document, and another type of TBS is a Research task, for which you must research the relevant authoritative literature and cite the appropriate guidance. You’ll only see a Research task in AUD, FAR, and REG. Completing a WC involves responding to a scenario, much like a TBS, but your response must be written in the form of the appropriate document related to the scenario (either a business memo or letter) and must address the needs and concerns of the designated party. Each exam section is divided into five testlets, and each testlet presents different numbers and kinds of questions. Each testlet includes questions that count toward your score (operational) and questions that don’t count. Operational questions count toward your exam score (pretest). Pretest questions gather candidate performance data to help the AICPA decide whether to include them as operational questions on later exams. You can’t distinguish pretest questions from operational ones, so answer all of the questions as well as you can. If it helps calm your nerves, when you see an unfamiliar question on the CPA Exam, just tell yourself it’s a pretest question, answer it as best you can, and don’t worry! Different types of questions are weighted differently. 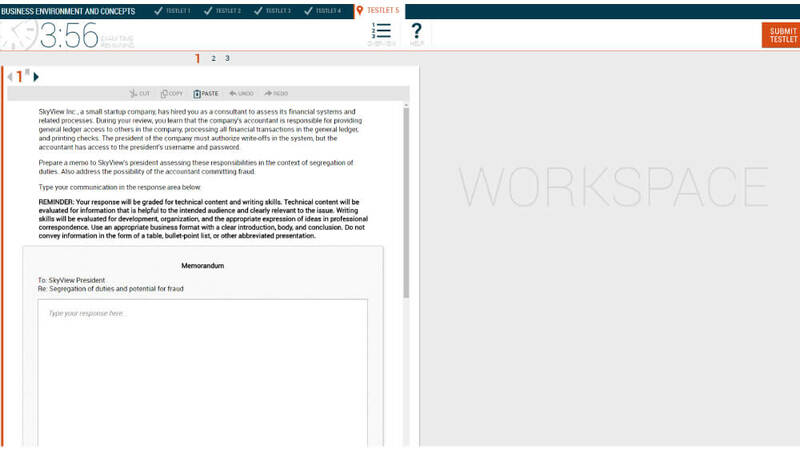 In each section, the two MCQ testlets contribute to half of your exam score. For AUD, FAR, and REG, the remaining three TBS testlets affect the other half of your score, and in BEC, the two TBS testlets and the one WC testlet supply the rest of your score. You can get partial credit for TBSs. For example, if you start with an incorrect response but you correctly calculate other answers based off that incorrect number, you may get credit for those later amounts even though they are technically incorrect, and in this way, a TBS can be worth more points than an MCQ. All questions are graded by computers, but if your BEC score is close to 75, human scorers will review and regrade your WC responses. The CPA Exam’s purpose is to ensure that candidates possess the knowledge and skill required for the CPA position. To fulfill this purpose, the MCQs, TBSs, and WCs evaluate candidates at four levels of skill. Remembering and Understanding Remembering tests pure memorization. Understanding tests the ability to understand memorized principles. Application This tests the application of memorized principles to a factual situation. Analysis This tests the ability to use multiple concepts together and apply them to a factual situation. Evaluation This tests the ability to evaluate information using multiple concepts to reach a conclusion. TBSs gauge your Analysis and Evaluation skills in a way MCQs generally can’t, and they are often more difficult, but when you study with the right CPA review course, TBSs become much more manageable. You should apply your time management system to practice quizzes and practice exams because this habit helps you get comfortable with tracking your time and staying on task during your study sessions. You should also resolve to follow your time management system as closely as possible during the exam because the sections with more questions (AUD and REG) can be tricky to get through in four hours. As you can see in the table above, extra time is limited, so mastering your time management system before you sit is an effective way to answer as many points possible and therefore maximize points. Where can you get plenty of practice with MCQs, TBSs, and WCs? The Gleim CPA test bank. Our superior test bank prepares you for every type of exam question. With over 10,000 unique, high-quality questions, our test bank is the largest on the market and the greatest opportunity you have to develop your expertise. Plus, our MCQs and TBSs are just as realistic and challenging as those on the actual CPA Exam, so they’re sure to help build your confidence. Finally, our test bank includes industry-leading answer explanations that will enable you to deepen your comprehension by connecting questions to concepts, so you’ll be prepared come exam day. You’ll find the biggest and best test bank around in the Gleim CPA Review System. Try it out for yourself by accessing our free CPA demo today!